The term hypoxia refers to a deficient amount of oxygen reaching the tissues. Anoxia describes an absence of oxygen reaching the tissues. Infants may be deprived of oxygen around the time of birth, and sustain hypoxic brain damage, also known as hypoxic-ischemic encephalopathy (HIE). Sometimes, a severe case of HIE may be referred to as anoxic brain injury. There is an interruption in the pathway that transports maternal blood to the fetus. Blood flow to the infant is unimpeded, but flow to the infant’s brain, specifically, is hindered. Blood flow to the infant’s brain is normal, but the blood carries an insufficient level of oxygen. Women with high-risk pregnancies must be carefully monitored in order to prevent their infants from sustaining anoxic brain injuries. Factors such as gestational diabetes, preeclampsia, obesity, and advanced maternal age can increase the likelihood of brain damage and other birth injuries. If medical professionals quickly recognize that an infant has experienced an oxygen-depriving insult, they can administer a treatment called hypothermia therapy. To be effective, hypothermia therapy must begin within six hours of the insult, which often means within six hours of birth. Hypothermia therapy involves cooling the baby to about 91 degrees Fahrenheit (33 degrees Celsius) for 72 hours. The cooling process slows down the spread of brain injury, allowing damaged cells time to recover. Neonatal cooling can minimize permanent brain damage and maximize long-term health and function in the baby. Long-term outcomes for children with hypoxic/anoxic brain injuries depend on the location, severity, and duration of oxygen deprivation, as well as whether they received hypothermia therapy in a timely fashion. Children with these conditions may require extensive care, including a variety of medications, surgeries, therapies, and special education services. They may also need round-the-clock supervision and support. Unfortunately, hypoxic/anoxic brain injury is often linked to medical malpractice. Oxygen deprivation can occur due to negligent prenatal care, labor and delivery management, or treatment of a newborn. One of the most common causes is failure to monitor for and quickly respond to signs of fetal distress. Fetal distress signals indicate that a baby is being deprived of oxygen; when a baby is in distress, an emergency C-section is typically required. Impending fetal distress (due to medical conditions or a difficult labor) should also be recognized as soon as possible. A prompt C-section delivery when a baby is currently or soon to be in distress is very important because the severity of brain damage increases with the length of time a baby is deprived of oxygen. Often, getting the baby out of the womb quickly is the only way to prevent permanent harm. Birth injury is a challenging area of law to pursue due to the complex nature of the medical records. 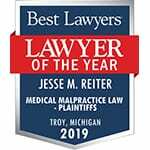 The award-winning attorneys at Reiter & Walsh ABC Law Centers have decades of joint experience with birth injury cases. We have numerous multi-million dollar verdicts and settlements that attest to our success, and no fees are ever paid to our firm until we win your case. We give personal attention to each child and family we help, and are available 24/7 to speak with you.